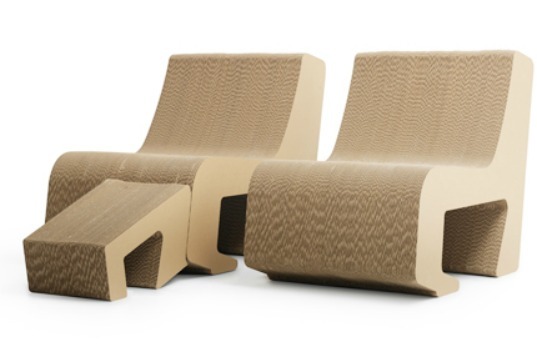 This awesome recycled cardboard armchair from Sanserif Creatius is a curvy and comfortable piece that maximizes space by concealing a separate footrest and coffee table within its seat. 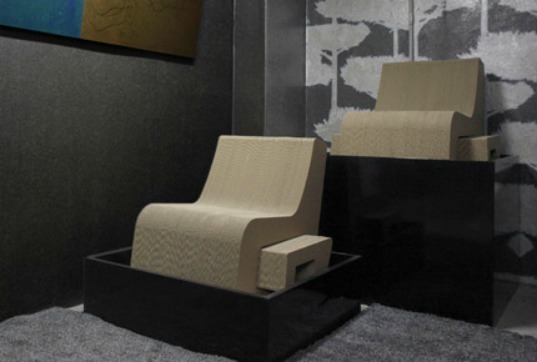 Dubbed ‘Prejudice’, the chair incorporates three elements in one using 100% recycled cardboard as its base material. The new chair joins the Valencian designers’ already sizeable collection of sustainable designs. Part of a limited edition collection, Prejudice was designed with the idea that it could be adapted to suit many different spaces. The team put social inclusion and environmental ideas at the forefront of their design, collaborating with the Association of Corrugated Board Manufacturers (AFCO) and the Special Employment Centre of “Apai Foundation” to promote socio-labor integration. This awesome recycled cardboard chair from Sanserif Creatius conceals a separate footrest and coffee table within the seat, maximizing on unused space. Dubbed 'Prejudice' the chair incorporates three elements in one the seat as an example of versatile green furniture. And by using 100% recycled materials the Valencian designers attempt to raise awareness about the importance of sustainable design. Part of a limited edition collection of furniture, Prejudice was designed with the idea that it could be adapted to suit many different spaces. And the team put social inclusion and environmental ideas at the forefront of their designs collaborating with the Association of Corrugated Board Manufacturers (AFCO) and the Special Employment Centre of "Apai Foundation" to promote socio-labor integration.